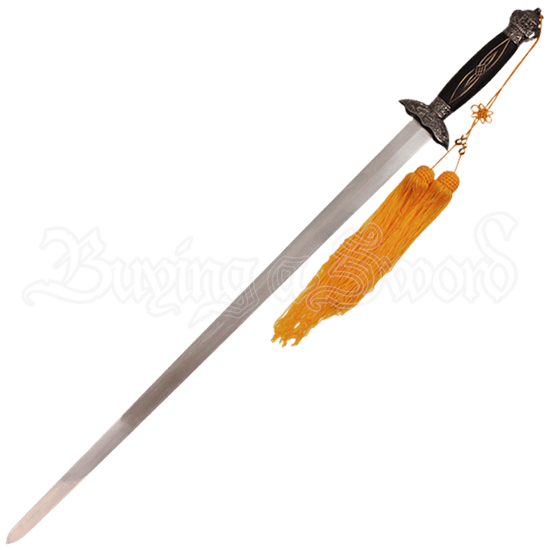 Imbued with the holy golden tones of Chinese culture and the auspicious powers of the mighty dragon, the Jinse Ju Long Tai Chi Sword brings balance to the world and all who wield it by sharing the power of such heavenly deities. A stainless steel blade is paired with the rich black wood of the handle, golden carvings lining the space between the guard and pommel. Two large tassels hang from the pommel in a rich golden hue that emphasizes the prosperous color. This expertly designed sword comes complete with a matching wooden scabbard, host to a subtle Chinese dragon carved into its body. Whether dragon warrior or oriental enthusiast, no collection or decor is complete without the Jinse Ju Long Tai Chi Sword!